And just like that this is my first official week home alone with our new little guy, Duke (more details to come soon!) and we’re hoping back on the blog train at the same time. Long time no talk! This kitchen post has officially taken me 3 days to write trying to squeak in a minute or two during nap time. Wish us luck, and send coffee vibes. 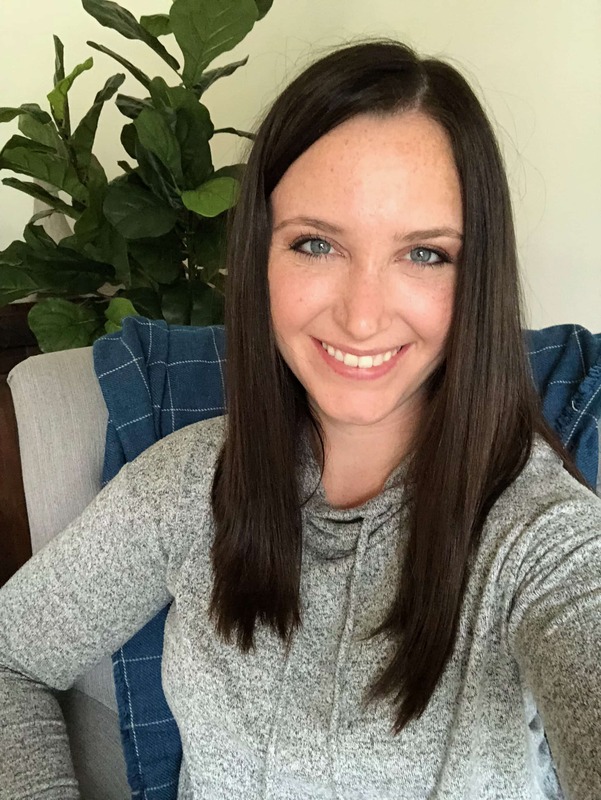 To be honest, I was hoping to blog in real time with the progress, but I decided to hold off for a few weeks to see how quickly the progress went. 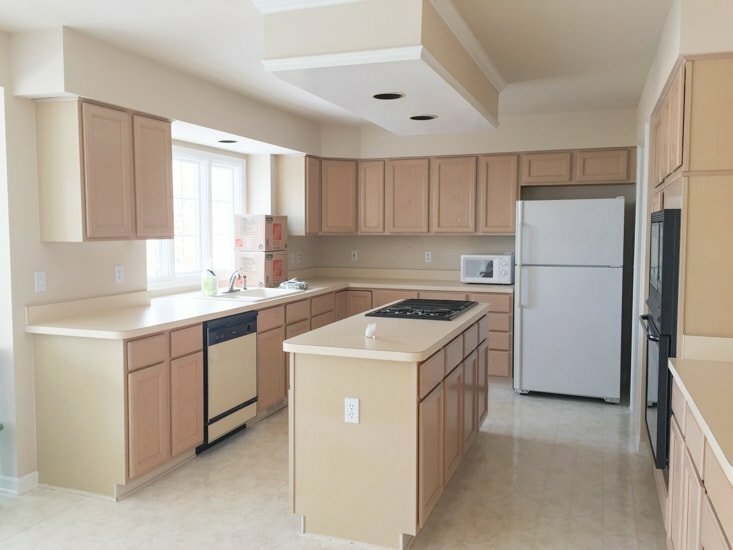 Now, months later, I’m glad this pregnancy put me in a zombie like trance and I never got around to posting since the kitchen was basically just finished a few weeks ago. We were at the point where we were having dreams about eating a home cooked meal that doesn’t involve milk and cereal. The entire house was turned upside down because if it, and I still feel like we haven’t really moved in. Got to love constantly living in a reno zone! We’re going to start off at the beginning today and fake that this project that has taken as long as it has (as in we started in May of 2017) has only taken a few weeks! We didn’t quite get to the point of buying a video camera and selfie-style documenting ourselves and how this is the worst thing ever to not have a kitchen HGTV style, but we were close. 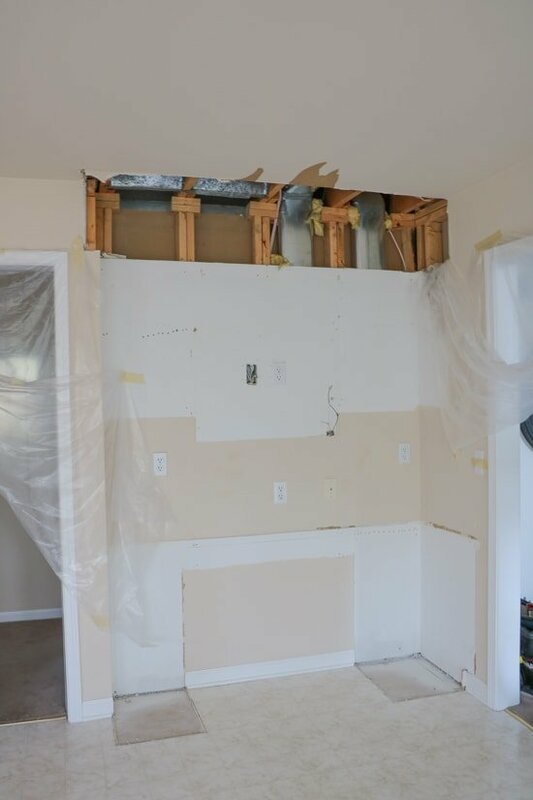 First off in any big reno, was demo! This kitchen was put together in the mid 90s, with peach stained cabinets, laminate countertops and linoleum floors. We originally played around with taking out the bulkheads and DIYing some uppers, painting the lowers, and adding a new countertop. 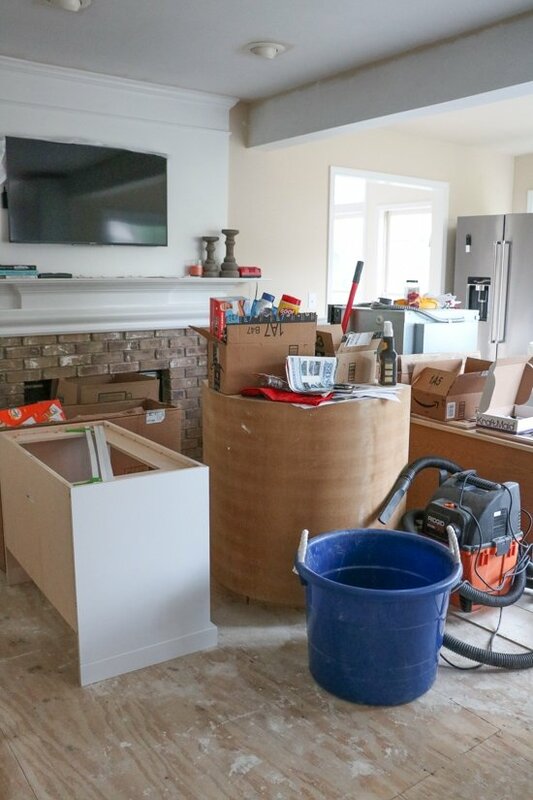 However, after talking it over, we decided that we were going to take this project up a notch (or 10) and do a full gut remodel. 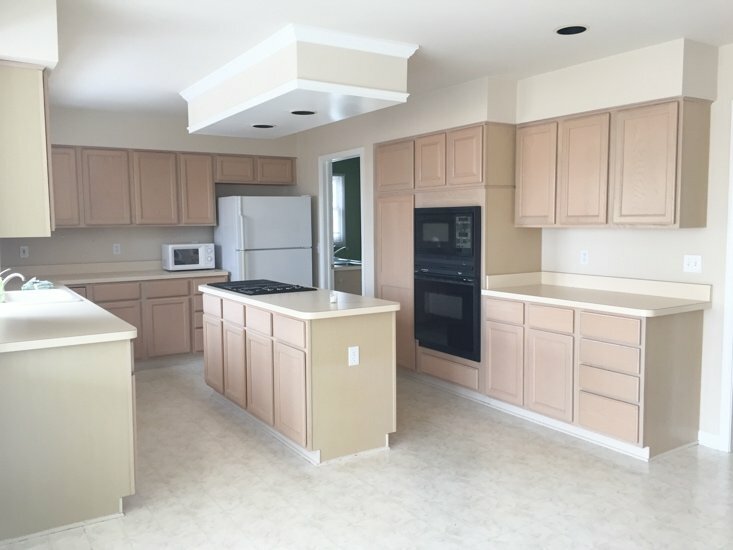 We like the general layout but the appliances were in rough shape and we had a few ideas for relocating them so moving things around just made it 10x more complicated. Thanks to a positive pregnancy test about 1 week before we started this monstrous project (and just for kicks on how long this project took – Duke is almost 3 weeks old now ha! ), M did the majority of the heavy lifting and I assisted with holding the uppers up while he carefully unscrewed everything. 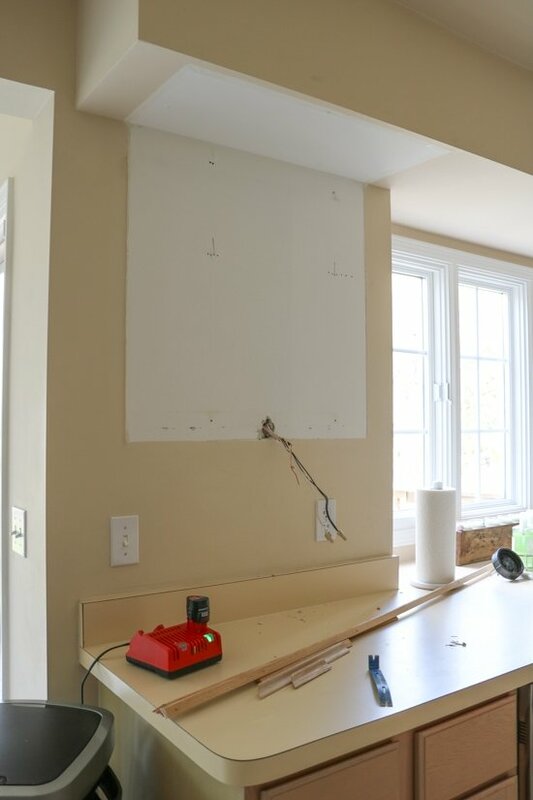 Our plan is to use everything that’s salvageable to create a kitchenette downstairs, and put the rest into the back room for all of our tools and supplies. 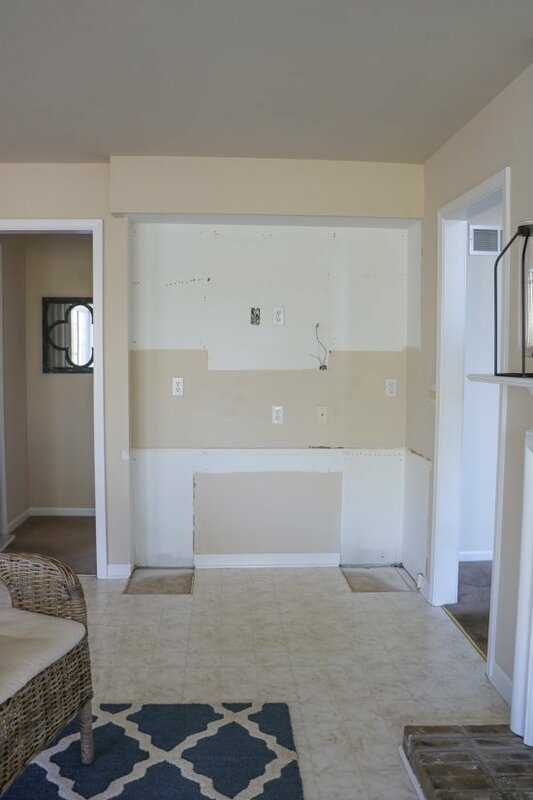 Our plan when we first started this full remodel project was to keep the linoleum floors for this phase. 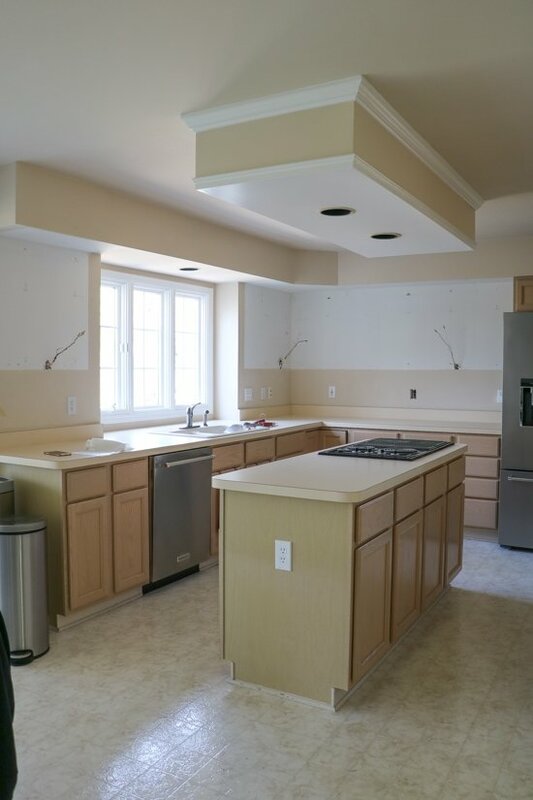 Since we decided to tackle the entire kitchen as opposed to parts, we didn’t know if it was quite in the budget. 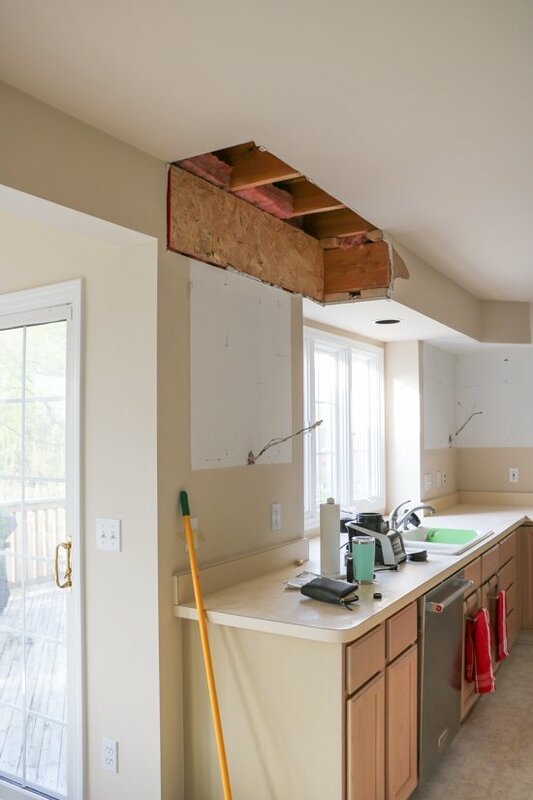 However, after looking at the design of the old kitchen and the new, we were worried that removing it later would be more of a hassle and cause more damage that was worth it. So, bye bye linoleum it was! A lot of hard work and thousands (we’ve tried to black this out from our memory) of staples later. 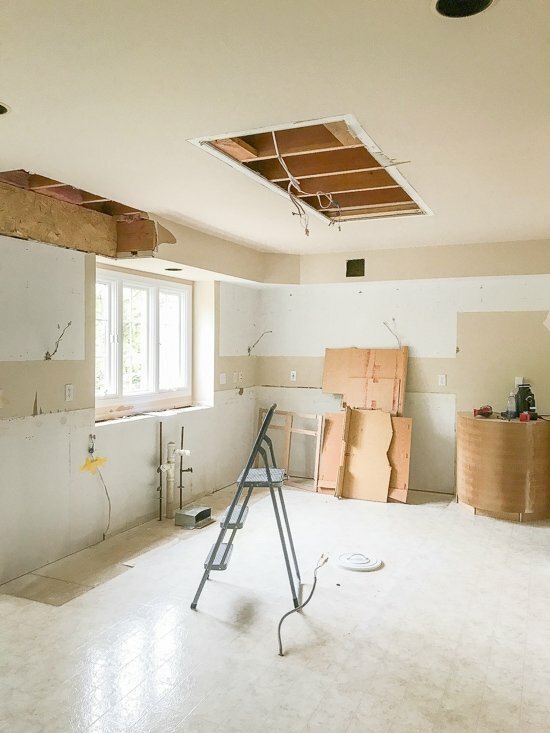 We had subfloor and one completely clean slate of a room! I wish we had some tips on how to get the floors up easily, but it was just a ton of hard work and swear words that got us through it. 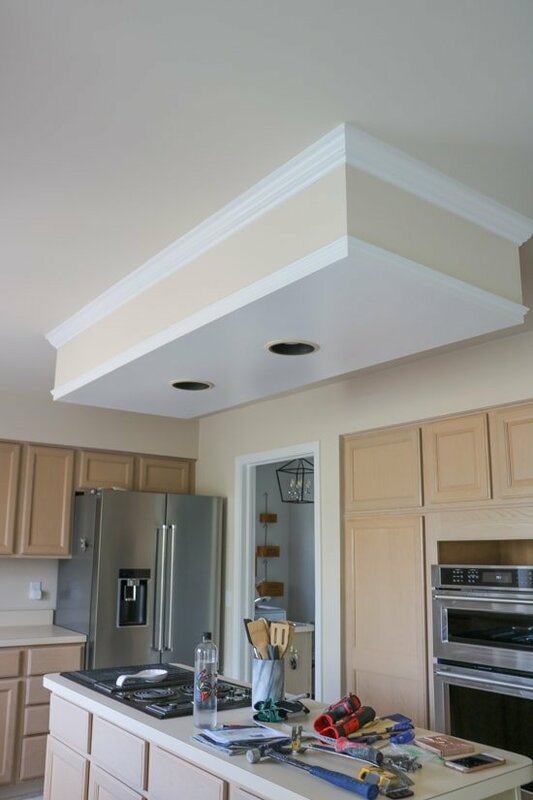 It will go down in history as Matt’s least favorite project ever, but ended up being so worth it in the end – the silver lining!